From the publishing studio that brought the world (that was not ready) Minecraft, comes what could be their next big game: Cobalt. This new 2D indie title is being developed by Oxeye and brought to consumers by Mojang. It will release first in Alpha format, much like the other blockbuster in Mojang's stables, and see constant updates until it launches in its full version. "We haven't told anyone [about the release date] yet because we're aiming for Friday, but we don't know if we can make it…But I think we can." The game will hit the PC platform first. No timeline has been given for a Mac or Linux compatible flavor. Cobalt is an awesome platform game featuring several game modes in both hot-seat multiplayer and in singleplayer. Cobalt comes with a game editor where players can create their own maps and adventures. 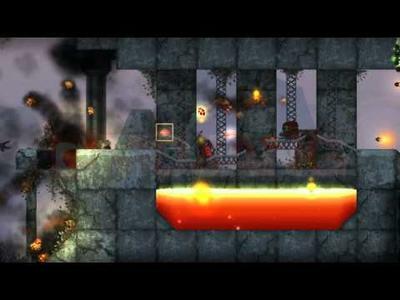 Cobalt is ALSO a platform game engine that can be used to create new modes or completely new games. What are the major milestones for the games development? Will you be giving this interesting new title a glance if it drops this Friday? Or will you choose to stick it out in your blocky world of wonder below the Minecraft launcher?